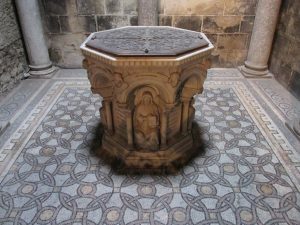 To our friends, the Ginots, this church was a must-see. It was closed when we first attempted to see it so we went back later in the week to be able to go inside. It was well worth the return trip. 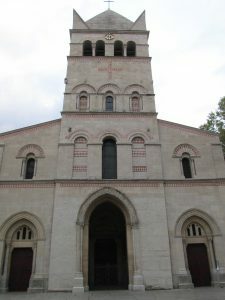 The basilica contains several architectural styles: the 11th century bell-tower and chapel of Saint Blandina are pre-Romanesque; the principal structure is 12th century Romanesque; the 15th century chapel of Saint Michael is Gothic; and the overall restoration and enlargement of the 19th century is Romanesque Revival. The simplicity of the principle structure (especially when contrasted with Fourvière) is stunning. 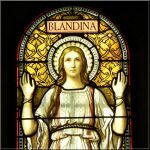 Despite its simple form, it is rich with details, ranging from the bas-relief column capitals depicting Original Sin and the Salvation of Mankind to the richly ornamented apse with a restored fresco painted in 1855 by Jean-Hippolyte Flandrin. Here are just a few images to whet your appetite. Click to enlarge and start a slideshow. 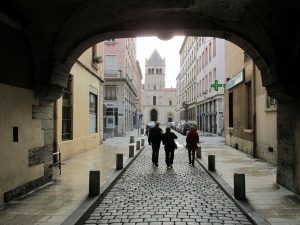 We approach the basilica via the voûte d’Ainay. 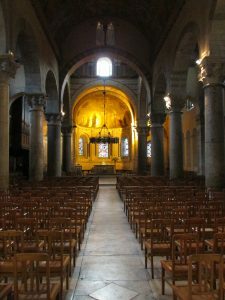 Looking down the nave toward the apse. 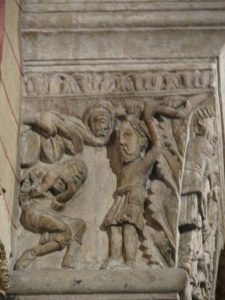 Abel is murdered by his jealous brother in the bas relief called “Cain and Abel”. 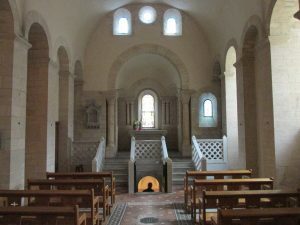 The chapel of St. Blandine. 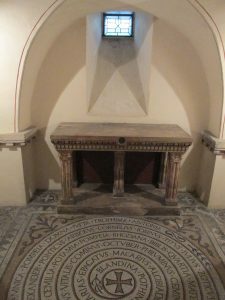 The crypt in the chapel of St. Blandine. 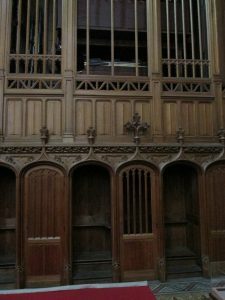 Confessionals built into the organ casework.